Your kid loves animals almost as much as he loves the Kratt brothers and we've been trying to make suit like the ones Chris and Martin wear, but we're still years away from getting it to work. The good news is that we have this Child Wild Kratts Green Cheetah Costume. It lets your kid look just like a powered-up cheetah from the show, so even though can't grant him any animal based super powers, he'll feel as wild as a real cheetah. You don't have to just watch Wild Kratts, now you can be a part of the excitement. 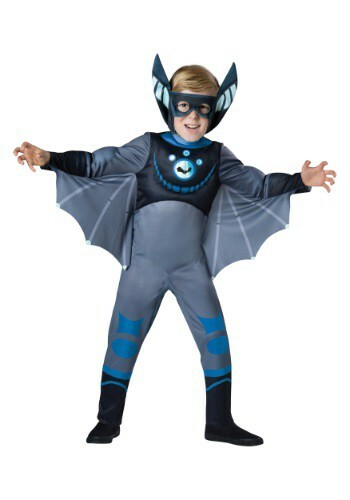 You can get a little batty and dress up in this Wild Kratts Blue Bat Costume. You can promote Martin and Chris Kratts message that bats aren't as scary as they seem while you fly around collecting candy in this cool costume. Activate creature power! You are going to need your power suit ready if you're going to be chased. This Wild Kratts Blue Cheetah Costume will turn you into the fastest animal in the outback. Aviva and Zach will try and make a vehicle that will outrun you...but there's no use. Your power suit is too impressive! Martin Kratt was all excited about the insects of the rain forest, until Grabsy, a baby spider monkey, took him on an adventure. The result was his Spider Monkey Power Suit, which looked a lot like this Wild Kratts Blue Spider Monkey Costume! He learned that spider monkeys can use their tails almost like an extra hand. Unfortunately the tail on this costume doesn't quite work that way, so that part will have to be up to your child's imagination. Bats are no longer frightening, thanks to Martin and Chris Kratt! The zoologists are great at explaining to children that all animals are good no matter how creepy they may look. 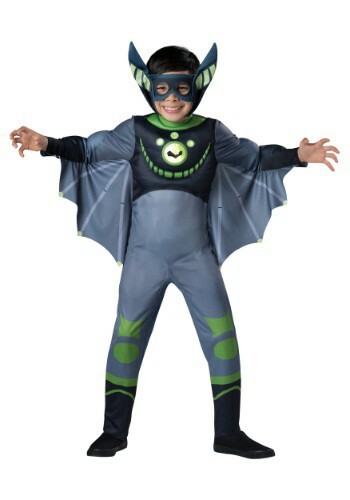 If your child is glued to the popular PBS kids show, he'll love wearing this Wild Kratts Green Bat Costume! It's time to power up with the ability of the spider monkey! Based on the Wild Kratts cartoon series, this Wild Kratts Green Spider Monkey Costume helps your kid understand just how cool animals are. It's based on the Creature Power Suit worn by Chris. Once he has it on, he'll be ready to get wild in nature, just like they do in the PBS show.